Since the weather has decided that rain is very much the order of the week so far our attentions turn to the contents of the greenhouse once again. We've not really blogged about it for a while but it's been keeping us in salad greens for the last few weeks now as the mixed leaves and rocket have sprung on amazingly. The container carrots we were experimenting with have also done well. 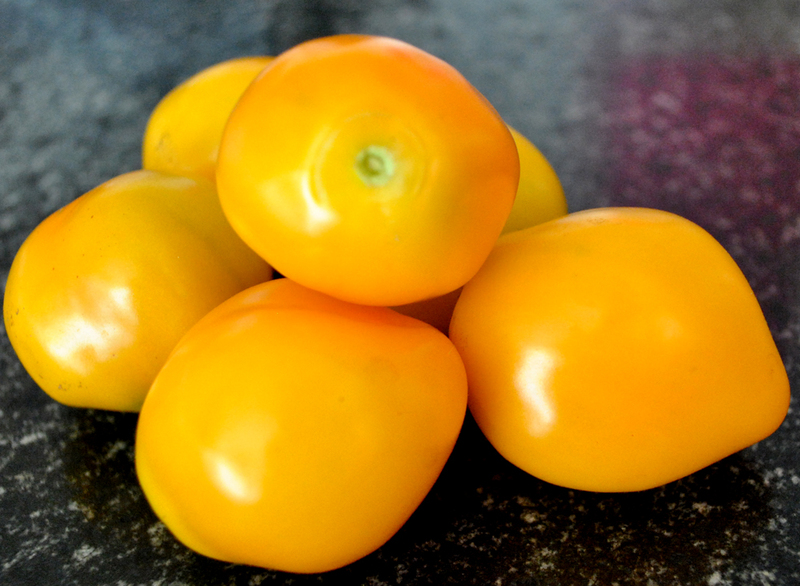 They're not very wide but they're a decent length and taste lovely and sweet, perfect for salads in fact. The cucumbers too have been doing really well, we've already eaten about five of them and there are loads more almost ready for picking. They're about half the length of your normal shop bought ones which is the perfect size for the two of us, we'll be growing these again next year for sure. The first tomatoes are also ripening. We had our first proper meal from the Golden Nugget plant last night and there are a load more that look less than a week away from being ready to eat. The Red Cherry isn't far behind either as you can see. 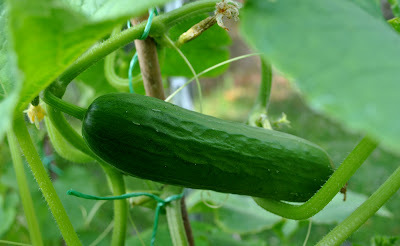 The African Horned Cucumbers are growing well but have no signs of fruit yet, the single Oca plant I held back from the allotment seems to be growing well in its pot and there's a teeny tiny fruit or two on the Cherry Bomb chili plant too. All being well we'll get back up the allotment one night after work to check on things, then its fingers crossed the weather improves so we can have the barbecue we're planning for Saturday. You are doing well - we didn't get round to sowing some carrots in containers this year. And we still haven't had much rain at all - it just comes in smatterings that don't last long and hardly wet the soil more than at the surface if that! I hope my few container-grown carrots turn out to be as good as yours! The big mature ones are very cheap in the supermarket so it's hardly worth growing them, but those little finger carrots seldom make it as far as any shops! I know what you mean about the weather. Drought in the Spring, now a deluge. Couldn't we just a have the "Happy Medium" please?? Wow everything looks absolutely perfect. We've been doing well here too, lots of things are almost ready or are showing good, promising signs. We are also growing carrots in a container and some in the ground too. We will just have to see what happens, but I will post updates on my blog. The tomatoes look great! Keep up the good work! How wonderful to have tomatoes already, mine are way off yet. My container grown carrots should be just about ready now, I'll have to pull some up soon and see how they've done. 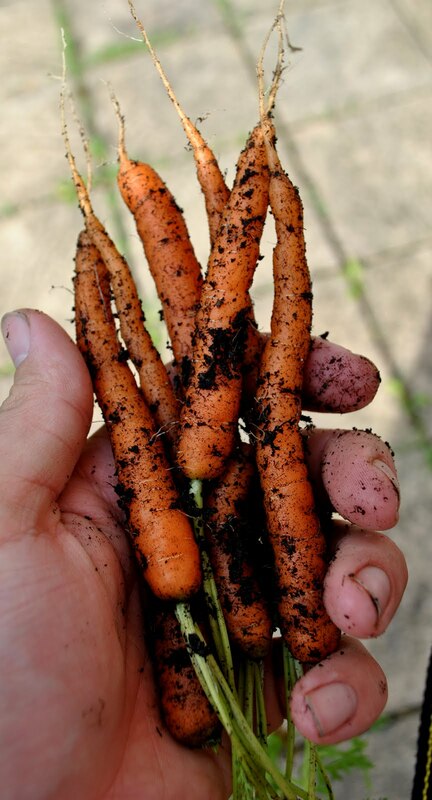 You don't need huge carrots when you grow your own, they're so packed with flavour that small ones are just as good. Oh wow that looks lovely! 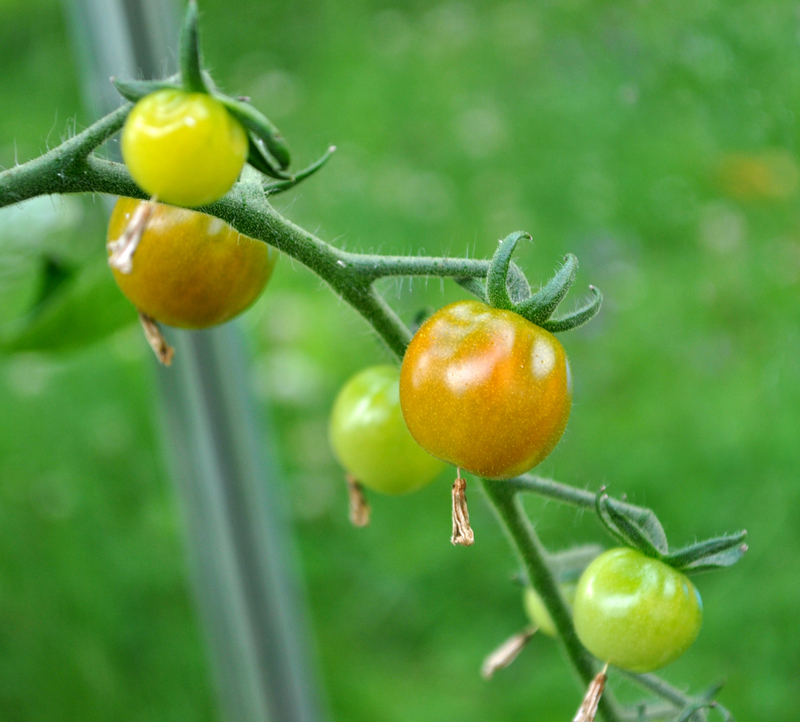 I actually have some tomatoes growing in my backyard now since the weather is fairly nice here. Was it difficult to grow the carrots?